Steve Johnson takes over the No. 2 spot from Sam Querrey. Jared Donaldson makes his debut on the Top 15 List at No. 15 with the aid of his maiden challenger title at the $50K Maui over fellow first-time American finalist Nicolas Meister (former UCLA Bruin). Ryan Harrison is back on the list at No. 11 with the Happy Valley Challenger title run. 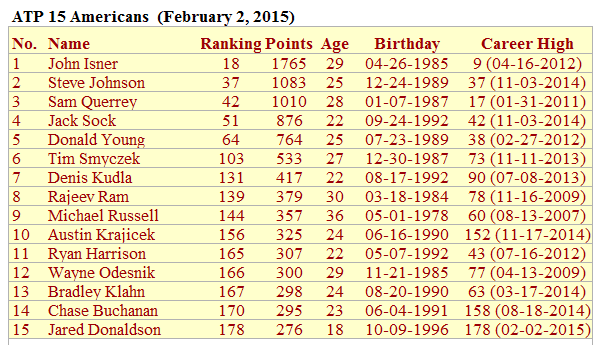 Alex Kuznetsov and Jarmere Jenkins are bumped off the list despite minimal changes from the January ATP rankings. Deiton Baughman debuts at No. 8 after winning his maiden futures title in Sunrise with five 3-setters. Thus knocking off 17 year old Michael Mmoh from the list. New career high for 6 players including birthday boy, Stefan Kozlov, who advanced to the quarterfinals in Maui (def. No. 9 American Michael Russell) and won his first challenger doubles title with Jared Donaldson. Honorable mention to 17 year old Francis Tiafoe who reached his first career futures final at USA F5, as well as the semis and quarters of two other Florida futures, last month (all losses coming at the hand of Benjamin Balleret). 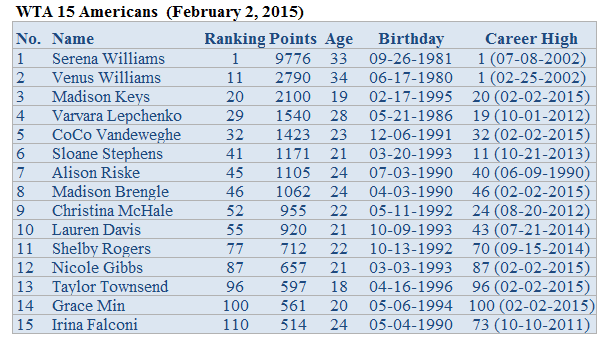 Serena Williams continues the stranglehold on the list with her 19th Grand Slam title (6th Australian Open). Venus Williams inches closer to the Top 10 after winning the Auckland crown and reaching the quarterfinals of the Aussie Open. New WTA career high for 1st time AO semifinalist, Madison Keys at No. 20. The teenager upset 2-time Wimbledon champion, Petra Kvitova, and Venus before falling to Serena. Big jump for Madison Brengle who reached first WTA tour final in Hobart and fourth round of AO. She went from No. 95 to No. 46 in less than a month! USTA AO Wildcard winner, Irina Falconi, replaces Vania King on the list at No. 15. Sachia Vickery won two $25K clay titles in Sunrise and Plantation, Florida, moving her one spot up to No. 8. Congrats to Taylor Townsend and Grace Min on their Top 100 debut!